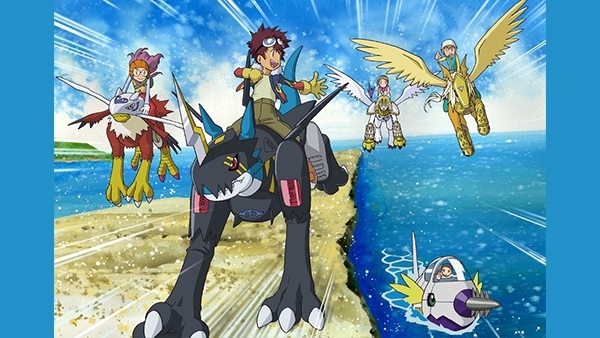 Digimon Adventure 02 is going to air in Japan on the Toei Channel. Last year they aired Digimon Adventure, and it appears the overall schedule this time will be setup roughly identically to maximize the ability for fans to be able to catch the series on TV. After that, the normal schedule begins on Monday, January 21st with episodes 1 and 2. Each Monday, at 7pm, 2 episodes of Zero-Two will air in a row. The next Monday, those same 2 episodes will air again at 8am. If you miss the second airing on Monday, one final airing of those 2 episodes will be done that same Friday at 8am. The schedule for the Toei Channel only currently goes up to dual airings of episodes 9 and 10 and single airings of episodes 11 and 12 (the schedule calendar only goes up thru the end of February at the time of posting), but the program page mentions they plan to air all 50. Thanks to Digimon writer Hiro Masaki for the info and our friends at DigiSoul for the heads up. Oh hey. 02. ...Maybe they'll lead up to something. We could hope huh. It's almost certainly not going to be the "remastered" version. Last year's airing of Adventure wasn't the BD version either and the channel page does not list it as HD.